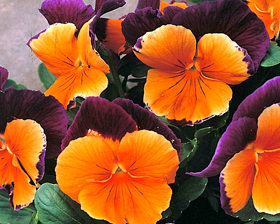 Jolly Joker, awarded the AAS Medal 1990 and the 1990 Fleuroselect Gold Medal, is probably the most spectacular pansy of its class. The intense orange of its lower petals, contrasts sharply with the deep purple of the upper petals. The effect is both unusual and intriguing. A very versatile and hardy variety which can be sown early for summer flowers or in summer for flowering in autumn and spring and even; in mild winters, through the winter. Height: 15-23cm. Flowering Period: February - November. Sow February to September. Seal container inside a polythene bag and keep at a temperature of between 15-20C. Germination will usually take 14-21 days.